A BRAND IS ONLY AS STRONG AS ITS STRATEGY. Before you start hawking your stuff, before you create that perfect, iconic logo and a biting tagline – you must plan and build a proper foundation. So today we’ll help you harness the power of “why? !” to your customers with brand strategy, as we work through it with our new startup, Special. The 4th installment in this special series that gives you a front row seat to our startup process! Get caught up and follow along with our previous posts. 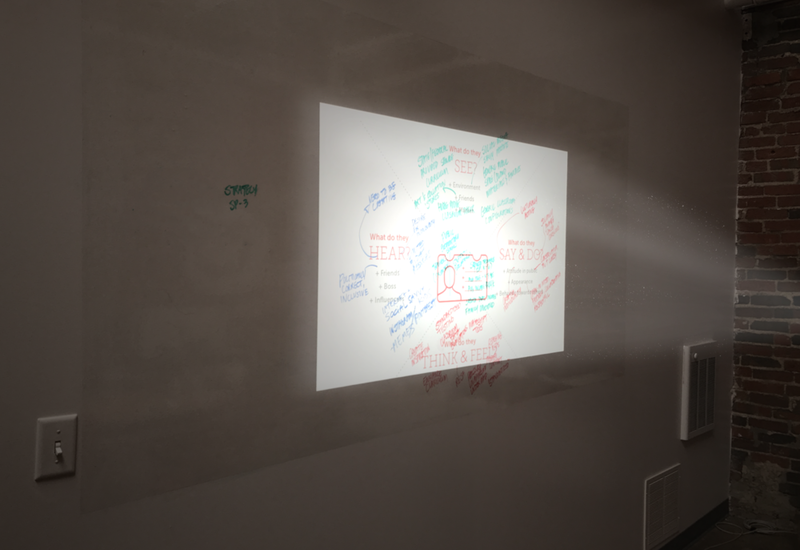 We turned our whiteboard into a strategy scratchpad thanks to our buddy @studiopence's projector. IT'S A STEP THAT OFTEN GETS OVERLOOKED. At CONSPIRE, we can’t understand why. Brand strategy is important. It’s more than just a logo, a name, or even the product itself. Brands outlive the goods and services they were initially created for, if their strategy is strong. That strategy can (and should) drive the culture and success of entire organizations, and when it works, it’s no accident. Apple is a great example – when you go to buy an iPhone, you aren’t just shopping for a functioning texting machine. Owning a piece of this brand is a de facto credential to be a member of a certain culture (just ask your friendly neighborhood creative), and buys you status, stylishness, and cutting-edge tech. These aren’t traits inherent to Apple’s products – they’re built into Apple’s brand strategy. They’re the traits that Apple communicates to its consumers strategically, mathematically, consistently – through messaging, images, ads, and even in their packaging after you’ve already forked over a small fortune for the thing. That’s what Apple consumers expect, and will enthusiastically, trustingly pay extra for. And that pre-planned brand strategy is directly rooted into the company’s insane level of long-lasting success. It’s the "red thread" that runs through everything Apple. It is, more or less, the whole point of creating a brand in the first place. At CONSPIRE, we’ve honed, over the years and through every industry imaginable, a step-by-step way to channel that strategic power and use it to fuel your brand. We created these exercises to ensure that we’ve exhausted every creative aspect of who you are and how you want consumers to think about your stuff. Today we’re going to share with you some highlights of how we do it, as we build a brand in real time! Watch, steal, share, and hopefully learn a tip or two from it. Kind of a messy process, but the takeaways from this are critical in establishing your brand’s position within your industry. Who should you be measuring your brand against? What are they best at? How can you borrow from their thinking? Where is the whitespace in the market where you can capitalize on an opportunity? Your competitors may not necessarily be in the same industry – for instance, Special will likely be competing with generic “lifestyle” brands that create personalized styles/looks for decorators, like Target, as well as education supply stores and the host of stuff available online. It’s really important to do your research and stretch the limits here, to hit every possible brand yours will be compared to, and figure how you can compete. Your differences will help to define you. Organizations who think their brand is primarily about them and what they want to accomplish are mistaken. Strong brands target an audience and work to understand how they think in order to inspire them into action. Now you have a purpose! You know your audience and who you’re talking to, you know where you stand with your competitors – it’s time to put together an anthem will rally people and inspire action. Although your anthem can be a powerful outward statement, it’s not always client-facing, it just needs to succinctly define what the heck your brand is all about. This is probably the hardest part. Here's our whiteboard before it turned into a scribble war zone. You’ll emerge with a statement that you can rephrase, cut down, and chop up as you see fit. We are creatives at heart, with heart. We believe that educators should not be limited by their tools. Great design can empower teachers to excel, and inspire people to learn. AND NOW YOUR BRAND HAS A BACKBONE. You established your audience, did your research, came up with a killer position and even have an anthem statement to rally behind. You’re now unified on all fronts, and will be able to direct your brand’s creation and execution consistently going forward. You have brand clarity. You may not be the next Apple, but you’ve certainly got a fighting chance. + Thanks to Brandon, our go-to web wizard at Studio Pence for letting us abuse your projector. We’ll put pencil to paper, create some logos and graphic identities, and start bringing Special to life.